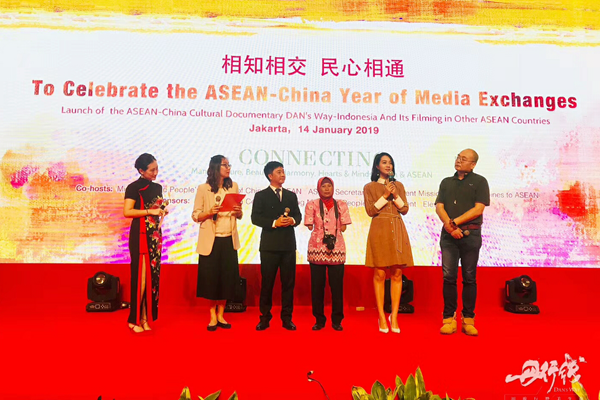 On 14 January 2019, Mr. Chen Dehai, Secretary-General of the ASEAN-China Centre (ACC), attended in Jakarta the Launching Ceremony of ASEAN-China Cultural Documentary Dan’s Way-Indonesia and its Filming in Other ASEAN Countries. 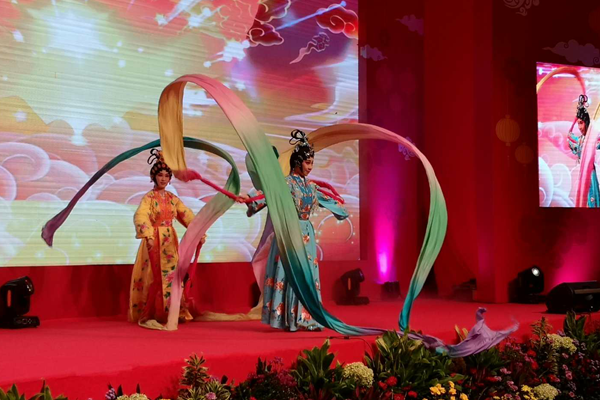 The event was co-hosted by Chinese Mission to ASEAN, ASEAN Secretariat, and Permanent Mission of the Philippines to ASEAN, and sponsored by ACC, Nanning Municipal People’s Government, and Eleven Media. 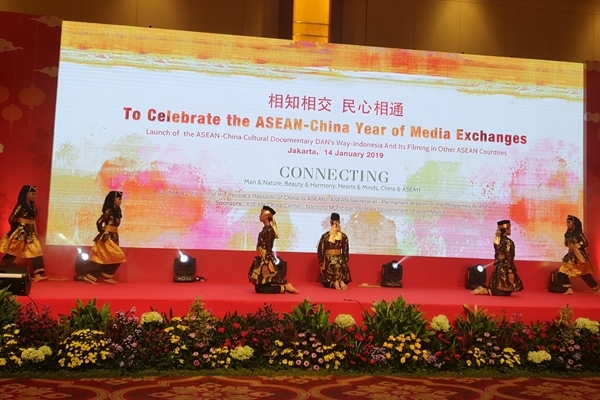 With the theme “Connecting”, the launching ceremony kicked off the celebrations of ASEAN-China Year of Media Exchanges at the Jakarta Channel. Mr. Huang Xilian, Chinese Ambassador to ASEAN, Mr. Kung Phoak, Deputy Secretary General of ASEAN, Mme. Elizabeth Buensuceso, Permanent Representative of the Philippines to ASEAN, Permanent Representatives of other countries to ASEAN, Mr. Jose Tavares, ASEAN SOM Leaders of the Ministry of Foreign Affairs of Indonesia, Mr. Chen Dehai, ACC Secretary-General, Mme. 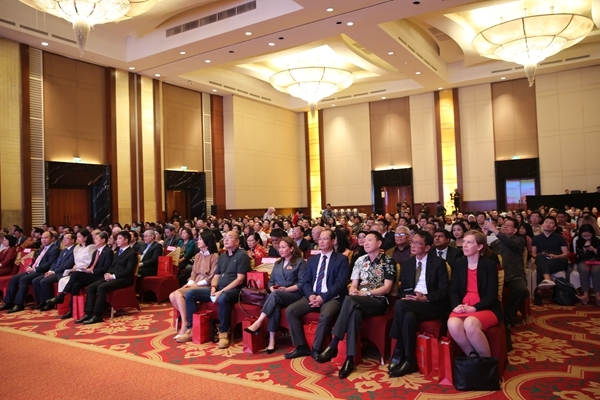 He Ying, Vice Mayor of Nanning, Dan’s Way team, and representatives from government departments, business community, and academia, totaling 500 participants attended the event. Ambassador Huang Xilian commended the documentary as touching, appealing, and connecting people across different languages, cultures, religious beliefs and borders. He said that media plays an indispensable role in people-to-people exchanges between ASEAN and China. 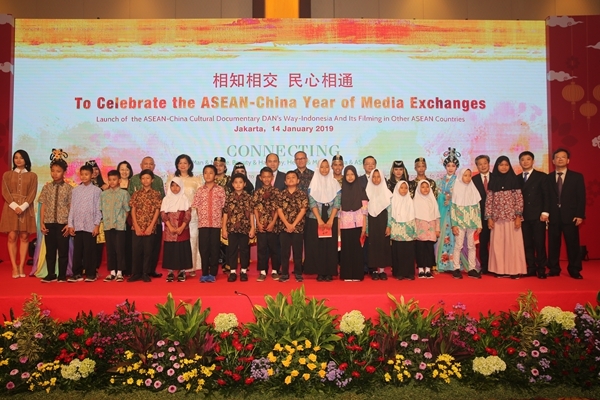 Media has both the power and responsibility to connect people and build bridges for understanding and appreciation.China hoped that the ASEAN-China Year of Media Exchanges would offer good opportunities for all sides to share stories and experiences, increase mutual understanding and deepen trust to build a closer community with a shared future. Mr. Kung Phoak expressed hope for both sides to seize the golden opportunities offered by the Year of Media Exchanges to tell more stories to the people of ASEAN and China. Ambassador Elizabeth said that ASEAN countries and China are committed to promoting people-to-people and cultural exchanges to strengthen mutual trust and understanding. She looked forward to the completion of the series focusing on all ASEAN Member States. Mr. Jose Tavares said that Dan’s Way had presented many common values for mankind which helped both sides seek common grounds and deepen friendship. Secretary-General Chen said that Dan’s Way, while showcasing the picturesque landscape of ASEAN countries, also focused on the extraordinary lives of the ordinary people, and told the true life stories which were indeed inspiring and appealing. It would start shooting the Philippine episode in 2019, to which ACC would give its full support. He hoped that Dan’s Way would play a positive role in deepening mutual understanding between the people of ASEAN and China and promoting cultural exchanges between both sides. 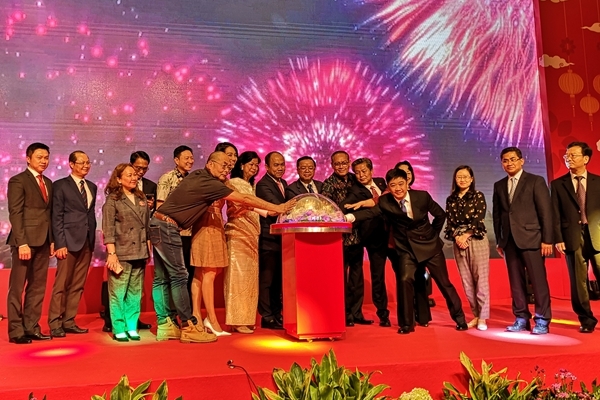 At the ceremony, representatives from China and other countries jointly launched the crystal ball, kicking off the celebrations of ASEAN-China Year of Media Exchanges at the Jakarta Channel. Participants watched the edited version of DAN’S WAY- INDONESIA followed by live interview with the crew team of the documentary. After that, Ms. He Yin, Vice Mayor of Nanning, Guangxi Zhuang Autonomous Region gave an overview of ASEAN-Nanning and ASEAN-Guangxi cooperation. There were a rich variety of cultural activities on the spot. 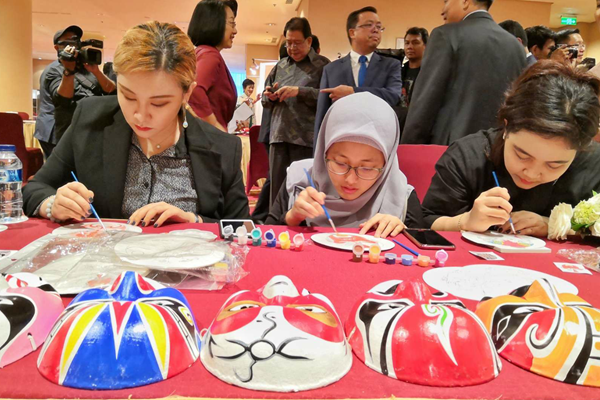 Participants enjoyed traditional Yong opera from Nanning and traditional Indonesian dance, tried on opera outfit, learnt to paint the facial makeup and practiced Chinese calligraphy. 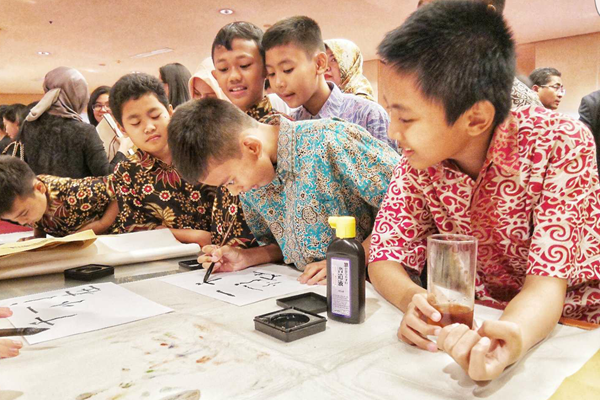 Students from Confucius Institute at University of Al Azhar Indonesia and Chinese calligraphers also gave calligraphy performance and wrote spring festival scrolls which created a festive mood. 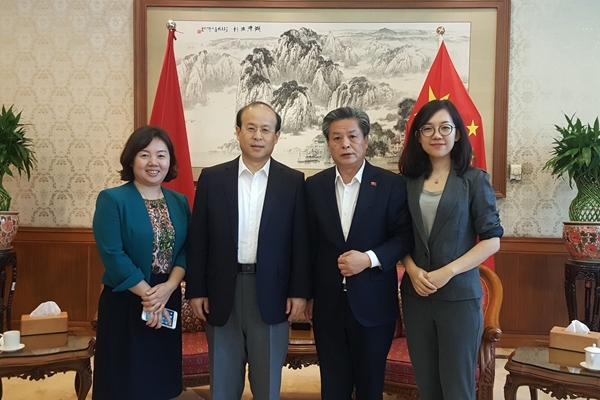 During his stay in Indonesia, Secretary-General Chen also met with Mr. Xiao Qian, Chinese Ambassador to Indonesia, and Mr. Huang Xilian, Chinese Ambassador to ASEAN.